Since 2009 the City of Toronto has required commercial and industrial new buildings to have green roofs. France recently adopted a law requiring new commercial and industrial buildings to have at least partial green roofs and solar panels. This kind of policy direction helps to move the climate change response incrementally forward. As more and more buildings comply with these laws, the detailed refinements in response will begin to emerge. In the US, many buildings are adopting green roofs as part of a sustainability strategy, but the response is scattered, and financing is an issue in many areas. The standards and initiatives vary tremendously among the 50 states. 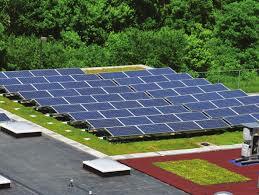 Combining green roofs with solar installations on rooftops has been tested and shown to be mutually beneficial. See the installations at Scalo Solar, for example. Here the Sunscape rooftop in Crafton PA, acts as a “showroom” for various configurations of solar arrays and technologies, including several versions of green roof installations. The various arrangements are fully instrumented and monitored to compare efficiency and effectiveness. The data stream is available to university students in Pittsburgh for research. Categories: Uncategorized | Tags: Climate Change, green roof, national energy policy, solar | Permalink. Pingback: Green Roofs: A National Policy to Help Address Climate Change | Patricia DeMarco Ph.D.